One morning, while seeing a mention of a disease on Hacker News, Bob decides on a whim to get tested for it; there are no other symptoms, he's just curious. He convinces his doctor to order a blood test, which is known to be 90% accurate. For 9 out of 10 sick people it will detect the disease (but for 1 out of 10 it won't); similarly, for 9 out of 10 healthy people it will report no disease (but for 1 out of 10 it will). Unfortunatly for Bob, his test is positive; what's the probability that Bob actually has the disease? without being conditioned on anything. Let's say that it's a moderately common disease with 2% prevalence. 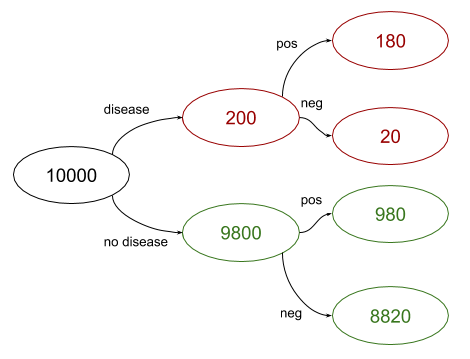 To solve this without any clever probability formulae, we can resort to the basic technique of counting by cases. Let's assume there is a sample of 10,000 people ; test aside, how many of them have the disease? 2%, so 200. Now we just have to count. There are 980 + 180 = 1160 people who tested positive in the sample population. Of these people, 180 have the disease. In other words, given that Bob is in the "tested positive" population, his chance of having the disease is 180/1160 = 15.5%. This is far lower than the 90% test accuracy; conditional probability often produces surprising results. To motivate this, consider that the number of true positives (people with the disease that tested positive) is 180, while the number of false positives (people w/o the disease that tested positive) is 980. So the chance of being in the second group is larger. 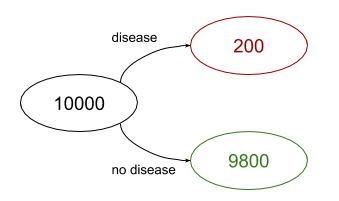 As the examples shown above demonstrate, conditional probabilities involve questions like "what's the chance of A happening, given that B happened", and they are far from being intuitive. Luckily, the mathematical theory of probability gives us the precise and rigorous tools necessary to reason about such problems with relative elegance. is the probability that both A and B occurred. In words - the probability that A happened, given that B happened, is 1/2, which makes sense when you eyeball the diagram, and assuming events are uniformly distributed (that is, no dot is inherently more likely to be the outcome than any other dot). In words: we know the chance that A happens given B; if we multiply this by the chance that B happens, we get the chance both A and B happened. This is an important equation we'll use later on. is independent of A. 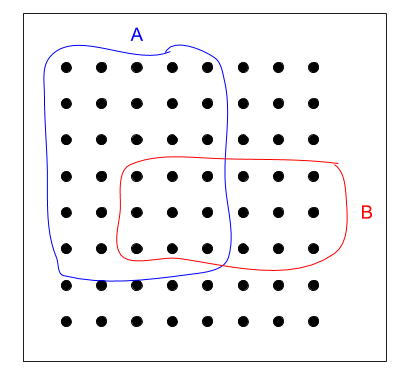 Similarly the complement of A is independent of B, and the two complements are independent of each other.
? You may be tempted to say it's 1 because "well, we know the test is positive" but that would be a mistake. To understand why, we have to dig a bit deeper into the meanings of conditional vs. unconditional probabilities. How do we update our beliefs in light of new data? : posterior probability of the test being positive when we have new data about the person - they have the disease. : prior probability of the test being positive before we know anything about the person.
. Instead, recall the "counting by cases" exercise we did in the first example, where we produced a tree of all possibilities; let's formalize it. Which is the same result we got while working through possibilities in the example. are two events for different tests. is a slightly different test that's only 80% accurate. Importantly, the tests are independent (they test completely different things) . In other words, if a person tests positive with the second test, the chance of being sick is only 7.5%. But what if they tested positive for both tests? Well, since the tests are independent we can do the usual probability trick of combining the complements. We'll compute the probability the person is not sick given positive tests, and then compute the complement of that.
. The chance of being sick, having tested positive both times is 21.8%. Unfortunately, this computation is wrong, very wrong. Can you spot why before reading on? in exactly the same proportion; say, increasing the prevalence 2x will increase both probabilities 2x. They're pretty strongly dependent! is working from first principles. ; the chance of being sick, given two positive tests, is 42%, which is twice higher than our erroneous estimate . We've reached the same result using two different approaches, which is reassuring. Computing with both tests taken together is a bit quicker, but taking one test at a time is also useful because it lets us update our beliefs over time, given new data. Computing conditional probabilities w.r.t. multiple parameters is very useful in machine learning - this would be a good topic for a separate article. This actual number of people is arbitrary, and it could be anything else; in formulae it cancels out anyway. I picked 10,000 because it's a nice number ending with a bunch of zeros and won't produce fractional people for this particular example. You may be suspicious of this assumption - how can two tests for the same disease be independent? Being suspicious about probability independence assumptions is a good idea in general, but here the assumption is reasonable.
? Depends on the test; some tests definitely test related things, but some may test unrelated things (say the first looks for a particular by-product of sick cells while the second looks for a gene that is known to be correlated with disease prevalence). It's possible to find plausible connections between almost anything though, so all independence assumptions are "best-effort". My intuition for understanding why it's higher is that there's a tug of war between the test accuracy and the prevalence (the lower the prevalence, the higher the test accuracy has to be to produce reasonable predivtive value). But when we recompute with two tests, we still use prevalence just once in the formula, so the two tests combine forces against it.